Generating invoices & other forms, etc. Apart from the above-mentioned things, it is used for several other things. Now, let us move to the general use of VBA Macros in Excel. If there is a requirement to enter the name of a company into worksheets, then users can generate a macro that performs typing for you. Moreover, this process can be extended as far as the requirement is. We can take the example of a sales manager to explain this point. If you are sales manager & need to prepare a report of monthly sale, then you can use VBA program. If users have to execute similar action on suppose 10 distinct Excel workbooks, you can create VBA macro. With this macro, perform the action on the primary workbook & then the macro does it on other workbooks too. Users may receive same series of MS Excel menu command. To avoid this, users can develop and use a macro that joins the commands into one custom command. This can be performed by one keystroke or button click. Users can even customize the toolbars of Excel with their own button, which performs the macros they write. With the use of VBA sers can customize Excel’s menus using their own commands that run macros they write. In many offices, there are people who do not really know that way to use the computers. 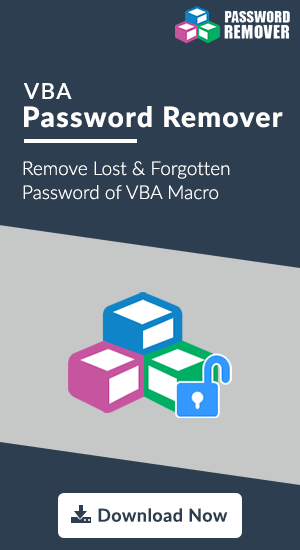 For them, VBA make this task easy. They can set up a data-entry template, so that there is no need to waste the time in doing common work. In case, users are willing to devote some time, they can use VBA in Excel for creating large-scale programs. These programs have custom dialog boxes, onscreen help, & many other accoutrements. Users must be familiar with the add-ins that ship with MS Excel. One the popular add-in is ToolPak. They can use VBA for the development of their own add-ins. In the above blog, we have learned how to use VBA macros in Excel and how it plays a very important role in the Excel. It is helpful for different propose and give users the capability to explore programming. They need to aware about VBA functions & data types to make their job easy. Copyright © 2012-2019 www.vbapasswordrecovery.net| All Rights Reserved.